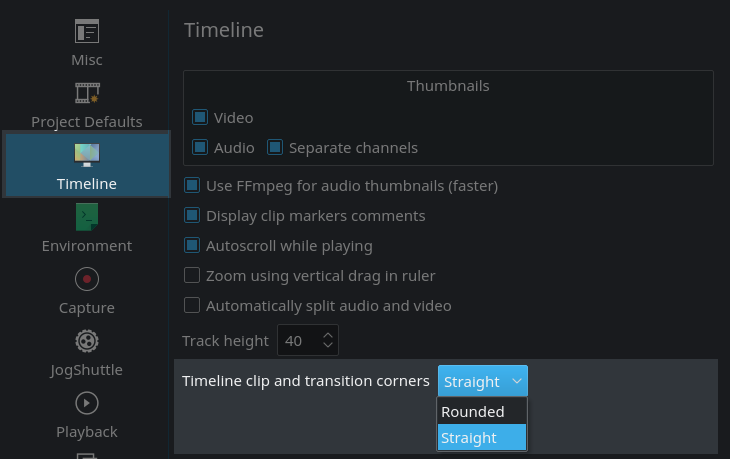 Since Kdenlive 16.08.1 you can now change the appearance of timeline clips and transitions: in addition to the classic rounded-corner design, we now offer a no-thrills angular corner design. This is the new Kdenlive timeline design, featuring the often-requested design where the corners or clips and transitions are simply corners … instead of cutely rounded edges. The idea here is that this design better reflects the old film metaphor; where, when cutting real film, the individual pieces of film had angular edges, but never rounded one. 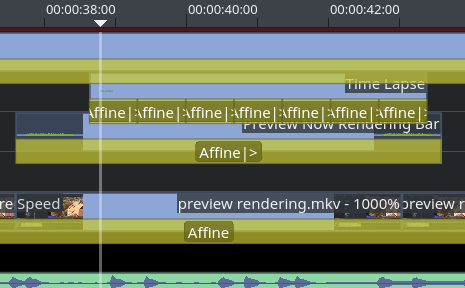 In contrast, this is Kdenlive’s classic timeline design featuring rounded corners for clips and transitions. It’s still available, so you can easily get it back if you happen to prefer it. Please see below. You decide which timeline design you like the best! Simply go to Settings > Configure Kdenlive…, then select the Timeline category. At the end of the options you’ll see a new configuration option Timeline clip and transition corners. Choose between new Straight or classic Rounded corners.